For Part 4 of our blog series on transforming grant-making using Salesforce, the topic is Finance Management. There are a number of elements to discuss here so they are grouped under the following headings 1) Payment management, 2) Fund tracking and 3) Integration with accounts. Each payment is recorded as a separate data record related to the funding request record (we use the term funding request rather than ‘grant’ to accommodate other funding types such as social investments) to track the amount, status and scheduled / paid dates. This means that either single or multiple payments associated with a single grant application can be created and edited throughout its lifecycle. Automatic transfer of payment instructions via an authorised BACS bureau (this will incur an initial set up charge and ongoing volume-based transaction fee from the chosen provider). This is less relevant for organisations that manage a single unrestricted fund from which all grant payments are made. However, in our experience, most grant-makers have separate budgets/funds associated with multiple funding programmes. Our recommendation is that Fund details should be stored on a separate record. This allows information related to the fund to be captured including free text or picklist fields to enter type, description etc. In our grantFlex product, we use the standard Salesforce General Accounting Unit object that comes within the Salesforce non-profit success pack, primarily because for grant-makers who also receive donations, this provides a way to track both the ins and the outs. For simple processes, this may be enough – the funding request (grant) record can be linked directly to the fund it is paid out from and reports can be run to group / filter all approved grants and related payments by fund. Of course, on top of the basic solution infrastructure, further sophisticated processes can be developed. Some of our larger grant-making customers produce fund statements for fund holders using merge document templates. Salesforce Community cloud can be configured to provide direct access to fund holders to view transactions in real time. There are many and varied accounts solutions used by grant-makers and the level of integration will depend largely on the transaction volumes, regularity of processing and the budget available for implementation. The simplest way to export financial transaction data from Salesforce is to run a report filtered by record status (e.g. Approved for payment) in Excel format. This can be provided to finance team members for entry into accounts. Once posted, a standard editable list view can be used to filter and mass update the status of payment records. To avoid double data entry (and human error that can be associated with manual data entry), one of the most common solutions that we have set up is to generate a formatted export file that is ready for import into accounts. To do this, we set up processes to group all payments with a specific status onto a Batch record where they can be checked, the file generated and the status automatically updated. This approach involves the transfer of data between Salesforce and accounts with no human intervention (apart from validating records of course). Depending on the accounts system, there may already be middleware available to avoid custom development (these typically incur a licence cost). Alternatively, if an API (Application Programming Interface) is available, a developer can programme the code required to manage the data transfer routine – this option will incur a higher set up cost but avoid any ongoing costs (and any changes would require development skills). We have experience setting up each of the above for organisations using Xero, Sage, AccessDimensions and many other accounts systems. Irrespective of the approach taken, we do advise that any accounts/nominal codes required for accounts are auto-populated on Salesforce before the record is transferred (using the in-build process builder tool). It is often the case that a Salesforce implementation provides the ideal opportunity to review the structure and volume of accounts codes – mainly due to the enhanced reporting now available to the grant managers. Hyphen8 has years of experience implementing grant-making solutions on Salesforce. If you would like more information get in touch. 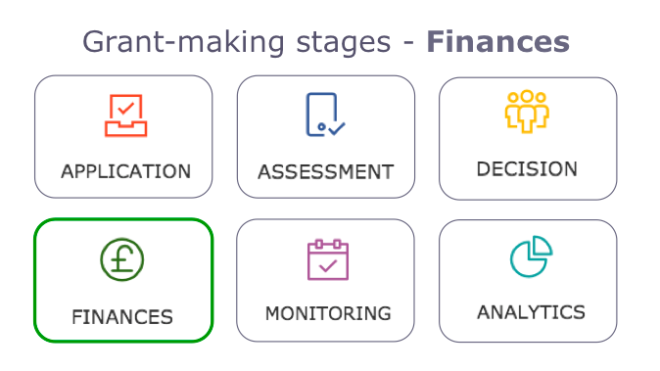 In the next blog, part 5 of this series, the focus is on grant Monitoring – the processes to manage grant reporting and outcomes evaluation.